오광대는 남부지역(낙동강 서쪽지역)의 탈춤을 가리키는 말로 초례 밤마리 마을 장터에서 놀던 광대패들에 의해 시작되었다고 한다. ‘오광대’란 다섯 광대 또는 다섯 마당으로 이루어진 놀이라는 뜻에서 비롯된 이름이라고도 하고, 오행설에서 유래된 오(五)에서 온 것이라고도 하는데, 오행설의 의견이 유력하다. 고성오광대는 제1과장 문둥북춤마당, 제2과장 오광대마당, 제3과장 비비마당, 제4과장 승무마당, 제5과장 제밀주마당 등 5개 과장으로 구성되어 있다. 등장인물은 문둥이, 말뚝이, 원양반, 종가도령, 비비, 중, 각시, 영감, 제밀주 마당쇠 등 19명이 등장한다. 양반과 파계승에 대한 풍자, 그리고 처와 첩의 문제 등 서민의 삶을 내용으로 하고 있다. 고성오광대는 다른 지역의 오광대에 비해 놀이의 앞뒤에 오방신장춤, 사자춤 같은 귀신 쫓는 의식춤이 없다. 주된 춤사위는 덧뵈기(탈놀이)춤이고, 반주음악으로는 꽹과리, 징, 장구, 북 등의 타악기가 사용된다. 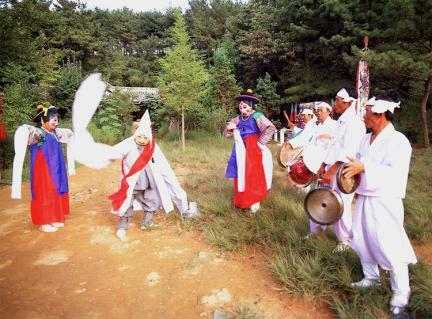 Goseong Ogwangdae, whose name is known to have originated from traditional belief in the Five Elements, is a form of traditional folk performance developed in the southern part of Korea including Goseong, hence the name. 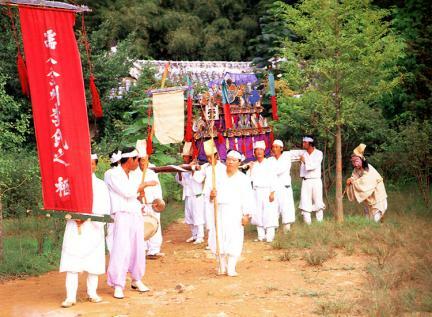 Initially, Goseong Ogwangdae was performed by the Ogwangdae troupe on the eve of the Daeboreum (full moon of the 15th day of the first lunar month), but it gradually came to be performed on other festive days in spring and autumn as well. 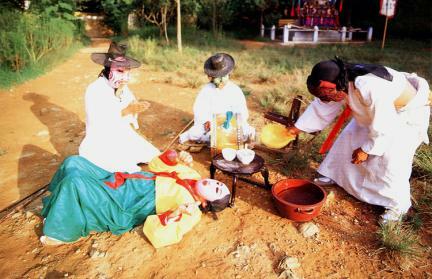 Goseong Ogwangdae can be traced back to the 1910s when a group of masked dancers in the Namchon Sect happened to watch a performance of the Tongyeong Ogwangdae (Mask Dance Drama of Tongyeong) which inspired them to develop their own version. 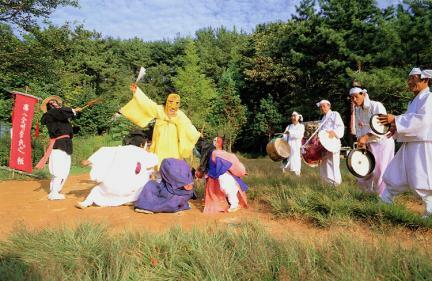 It was later influenced by the Changwon Ogwangdae (Mask Dance Drama of Changwon), too, when it developed five dances to form each episode, namely, the Leper’s Dance, Ogwangdae Dance, Monk’s Dance, Bibi Dance, and Jemilju Dance. 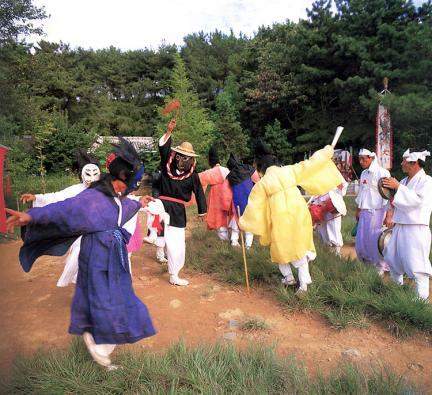 These dances are presented by a total of nineteen characters including Leper, Malttugi, Won Yangban, Cheongje Yangban, Jeokje Yangban, Baekje Yangban, Heukje Yangban, Hongbaek Yangban, Jongga Doryeong, Bibi, Bibi Yangban, Monk, Bride, Old Man, Old Woman, Jemilju, and Servant. Each performance focuses on the life of commoners, the complex relations between people from different rungs of society, and the absurdity and hypocrisy of Confucian aristocrats and Buddhist priests. 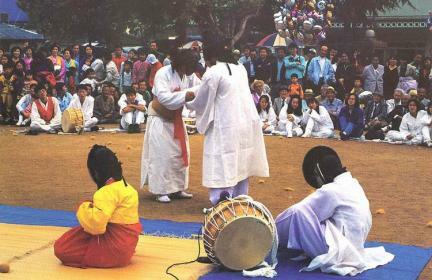 Unlike the performances by other Owangdae troupes, its dances lack elements of the shaman’s dance, which was performed to expel evil forces, and instead include more entertaining elements. 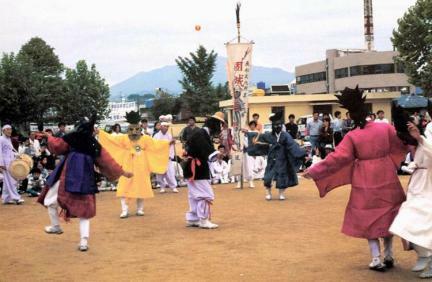 Performers of Tongyeong Ogwangdae wore paper masks in its early days, but recently they have begun to use masks made of paulownia wood or gourds. 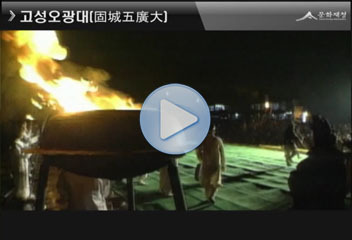 Tongyeong Ogwangdae is now inscribed on the list of Important Intangible Cultural Heritages.